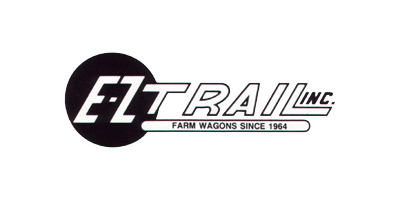 Since its small beginning with running gears in the 1960`s, the E-Z Trail line of wagons has continued to grow into the most complete line of farm wagons anywhere. It now includes grain carts, gravity wagons, seed wagons, bale racks, bale baskets, bale feeders, combine head haulers, compact wagons, and of course, the world`s best trailing wagon gears - which are now better than ever! With a dream in his heart and a torch in his hand, he replaced all the worn parts: brackets, bolts, bushings, pins, and clevises with a stub axle that he removed from an old pick-up truck. To this 'new king' pin with tapered roller bearings he added a steering frame and tie rods with greaseable ball joints. When he tested the steering and saw how 'E-Z it trailed,' he knew in his heart that his wagon would never wag again! Give God the glory—'necessity' the mother of invention did it again. Our commitment to provide products with high limits of performance and excellence may have selfish undertones. But it is also a desire to promote innovative new concepts that will contribute to the continuity of life on the family farm as we know it. A life that others. .. dream about, and long for. Or it just may be our attempt to imitate the ways of the man in... overalls.